He braves the space-ways in the twenty fourth and a half century. He keeps the people of Earth safe from the insidious Martian scourge. He is a cartoon duck. 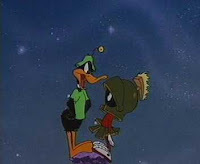 Duck Dodgers is a jerk. He's a greedy, grasping, cowardly, criminally negligent egomaniac. Surviving like an avian parasite on the efforts of his devoted underling, the hapless Eager Young Space Cadet. Dodgers is a cad with the ladies, cheap as a wooden nickel, and always out for himself. Only a deluded fool or a bloated military would put him at the helm of a spaceship. Worse, because he's a cartoon, he is completely un-killable. Fortunately, he's off the air now, and we can rest easy. Especially because he is VERY metafictional: a character portrayed by the equally fictional Warner Brothers cartoon star Daffy Duck (the Chuck Jones/Tex Avery creation who is in turn portrayed by Mel Blanc, and in his 2003 Duck Dodgers TV series by gifted mimic Joe Alaskey). From his first appearance in 1953 to his swan song in 2006 on Cartoon Network (a series I greatly enjoyed but which some criticized as 'playing to the lowest common denominator') I love to hate this guy. Just as I love the lowly Cadet, pompous I.Q. High, sultry Queen Tyr'ahnee, and of course, the ever obsequious Marvin the Martian. But if the duck doesn't get top billing, it's curtains for me with disintegrator pistols, see? Moreover, I love my wife for bringing them all back to me across the interwebs. It's a dated sci-fi parody that only someone who's not too particular could love. And I do! As long as it's not obstructing my view of Venus. Finally, thanks to Duck Dodgers, there is someone LESS worthy to be a Green Lantern than G'Nort.